Can You Name These 1990s Country Songs From Their Lyrics? 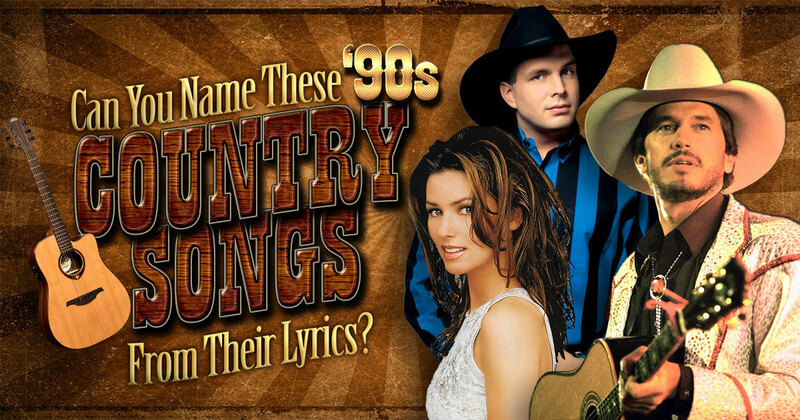 In this quiz, you get a few lines from a ’90s country music hit. Can you guess the song correctly? Take up the quiz challenge now! Don't rock the jukebox. I want to hear some Jones. 'Cause my heart ain't ready. For the Rolling Stones. I don't feel like rockin'. Since my baby's gone. Looking back on the memory of. The dance we shared 'neath the stars above. For a moment all the world was right. How could I have known that you'd ever say goodbye. Baby all I got is this beat up leather bag. And everything I own don't fill up half. But don't you worry 'bout the way I pack. All I care about is getting back real soon. I bet you've never heard ole Marshall Dillion say. Miss Kitty have you ever thought of running away. Settling down will you marry me. I see the questions in your eyes. I know what's weighing on your mind. But you can be sure I know my part. 'Cause I'll stand beside you through the years. Should Have Been Different But. It Wasn't Different, Was It. Same Old Story, Dear John, And So Long. Should Have Fit Like A Glove. This is what a woman wants... Any man of mine better be proud of me. Even when I'm ugly he still better love me. And I can be late for a date that's fine. But he better be on time. Every time our eyes meet. This feeling inside me. Is almost more than I can take. Baby, when you touch me. I can feel how much you love me. And it just blows me away. Dancin' in the dark. Middle of the night. Takin' your heart. And holdin' it tight. Everybody wants a little piece of my time. But still I put you at the end of the line. How it breaks my heart to cause you this pain. To see the tears you cry fallin' like rain. I laid a red rose. On your front porch. Wrote I love you. On a note. I rang the door bell. And turned to go. Baby when the curtains moved. I couldn't believe the view. Well it's been a long time glad to see your face. I knew we'd meet again another time another place. Can't believe it's been so many years. Blame it all on my roots. I showed up in boots. And ruined your black tie affair. The last one to know. The last one to show. I don't want another heartbreak. I don't need another turn to cry, no. I don't want to learn the hard way. Baby hello, oh no, goodbye. Can You Name These 1980s Country Songs From Their Lyrics? Can You Name These Hank Williams Hit Songs? Can You Identify These Food In Black And White? Can You Name These Beatles Hit Songs?